Mario Sughi, "Self Portrait with Fetuccine and Guinness 2010"
Mario Sughi, aka nerosunero is an Italian artist and illustrator living and working in Dublin, Ireland. 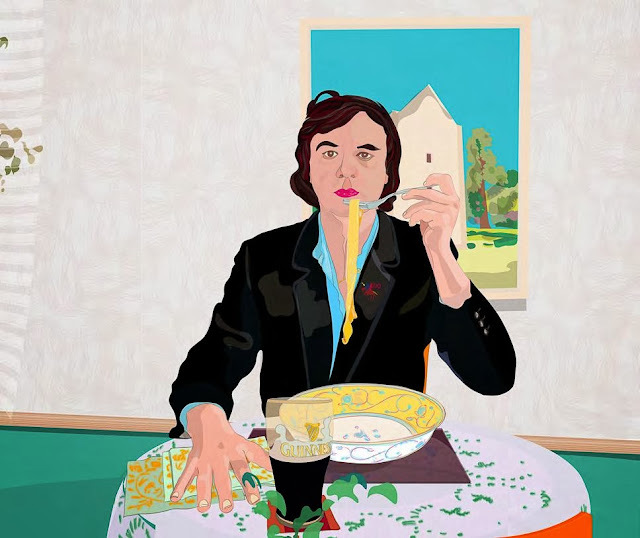 His evocative works draw influences from British Pop-Art and old Italian masters, capturing a moment in time where the relationships and players are merely hinted at, leaving the viewer to flesh out the stories in their own imaginations. Mario Sughi creates his work directly in the computer using a graphic tablet. He relies on his own sketches and photographs as inspiration, but his artistic process means that his work exists only as prints. Mario's fine art portfolio and editorial lifestyle illustrations have appeared in galleries and publications across Europe. "If we reflect on Mario Sughi's works we can certainly recognise the influence of British Pop Art but also of other elements. There is the intentional suspension of time, his wish to depict non-events, to draw and colour figures who have no history, if not in those tiny gestures that are hinted at, or suggested, because they are always subtly ambiguous. I think that, in the dimension of the new depiction of British figurative art today, but also of Italian art, Mario Sughi’s work is important, principally because of his capacity to enrich the ancient language of art with the novelty of new expressions, like the influence of comics, affiches and illustrations. This is a new pictorial language: original, innovative and of the highest quality." Visit Mario Sughi aka nerosunero's website or follow him on Twitter, Pinterest, Tumblr, or Flickr.